How often has (or how common is it for) the ISS's orbit been propulsive lowered intentionally? The question Which engine worked the hardest to keep the ISS in orbit? laments the tireless efforts to keep the ISS from falling from the sky by regularly executing propulsive orbit-raising maneuvers. How often has, or how common is it for a propulsive orbit-lowering been executed intentionally? One might think never at first, but these rocket scientists play games with fast flights from the ground to the ISS and that sometimes requires phasing and comments note there are collision avoidance maneuvers as well, so it's not inconceivable that it may have happened. Of course it means there needs to be an engine pointed in the prograde direction, so there's that. TLEs and SGP4 may help. The reboosts are clearly shown, but there is no deboost (the spikes you see immediately after a reboost are TLE artefacts). there is a sudden radius vector drop, while now I’m saying that there are no sudden drops. 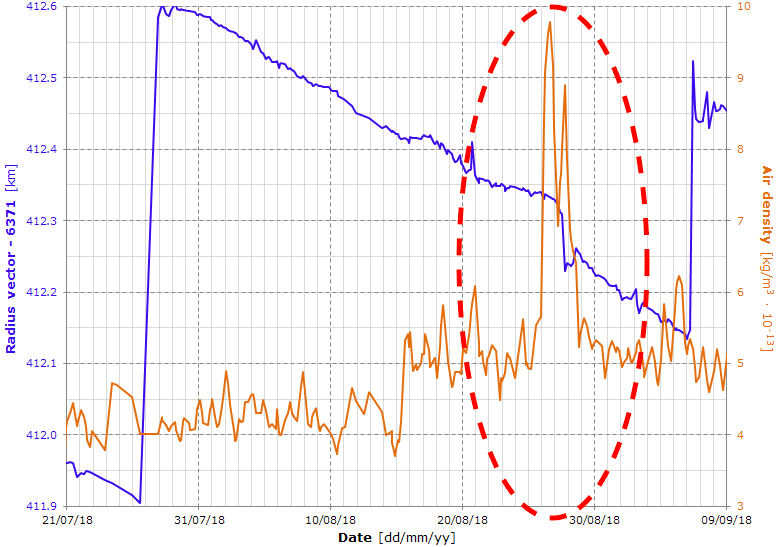 It’s absolutely clear that the sudden drop shown in the second graph is caused by a big increase of the air density and not by a “propulsive orbit-lowering executed intentionally” (aka deboost). Since he asked: "How often has a propulsive orbit-lowering been executed intentionally? ", I’m just saying that for the graphed period there are no “propulsive orbit-lowering executed intentionally”. For a deboost, we probably should expect a negative LVLH DVx component (but I’m not totally sure). we can obtain a good estimation of the deltaV also for values as small as 50 mm/s or better. Not the answer you're looking for? Browse other questions tagged iss orbital-maneuver engines orbital-phasing or ask your own question. Has the psychological impact of social media exposure for astronauts aboard ISS been studied? How common is the ability to compensate for a lost engine through gimbaling?